Damn this is a good issue. The opening and closing sequences deal with Starman and the energy erupting out of him, but the bulk of the story takes place on Thanagar Prime. 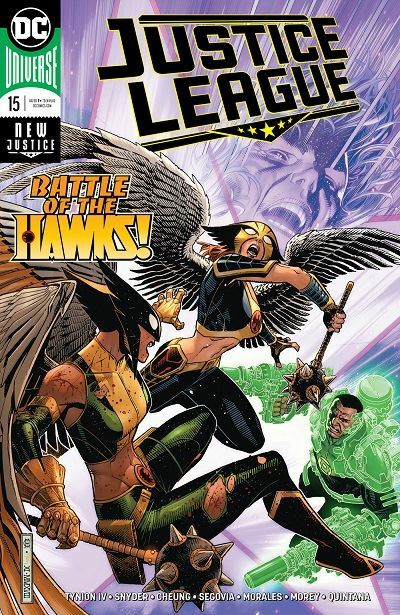 As the cover implies, it builds to a battle between Hawkgirl and Hawkwoman, but a lot get revealed along the way. The issue is such a good example of world building. We had already seen that Thanagar Prime is full of vaults, and now learn that it has become a significant storage facility for a variety of alien species, some none too friendly. Shayera is in command of this new world, settled after the destruction of Thanagar, and is not about to let anyone mess things up for her. With so much tension in the air, it’s hardly surprising that all is not as it seems. Hawkwoman lied last issue, about the Living Memory of Mars, and the Manhunter is determined to find her. More revelations ensue once he does, but that is all I am going to say about that. I really love how this book is unfolding. We’ve had the Legion of Doom, Drowned Earth, and now the secrets of Thanagar as major story threads, yet all of these are part of the larger storyline that has been going since the first issue. That shouldn’t work. It really shouldn’t. The main story should be feeling as if it is dragging, or has been abandoned. The major plot threads should feel as if they are getting in the way of the overall arc. But none of that is happening. I’d tip my hat (if I wore one) to the skilled plotting of Snyder and Tynion. The art is very good on this one. Not great. I have to be critical of something, after all. While there is nothing I can point to as any sort of weakness in the visuals, there is also no page in the story that made me gasp and stare at it with amazement. But that’s about the only negative comment I can come up with for this issue. It’s all been such a fun ride, and the tease for the next issue promises more wildness is in store!